I haven't really bought a laptop for gaming before. After some research I've ended up with two models at a close sale price. Need recommendation and reason for as to what to pick. that's a tough decision, both have pros & cons, and not really loving either in all honesty. Thats a laptop Lutij.. no real way to upgrade to the 1060 that I am aware of.. I do have 2 laptops with the i7 8750H and yea that laptop chip flies. it would be an better option (I have 2 FX504 laptops and they are great) a lot better option overall for sure. The fast CPU AND GPU.. Only thing it lacks is the 16 GB of ram.. you can add later. Thats a laptop Lutij.. no real way to upgrade to the 1060 that I am aware of..
Lutfij was suggesting the higher spec'd CPU and GPU *because* you can't upgrade them. The ram can be upgraded but you can't get a higher spec'd CPU or a higher discrete GPU later down the road. it would be an better option (I have 2 FX504 laptops and they are great) a lot better option overall for sure. The fast CPU AND GPU.. Only thing it lacks is the 16 GB of ram.. you can add later..
1. 16GB right off the bat. 2. The USB-C port (I don't believe is present on the ASUS?) should support external GPUs in future, once the 1060 inevitably becomes less impressive. Whether those justify the price difference is debatable. To me, they do.... but it's entirely subjective. Option B easily, much more well rounded machine. Getting I7 and terrible everything else is a poor experience and that 144Hz display is useless powered with something like 1050Ti anyway. Reality is difference between those I7 and I5 for gaming is not big, but between 1050Ti and 1060 is substantial and extra RAM is also a good idea there. 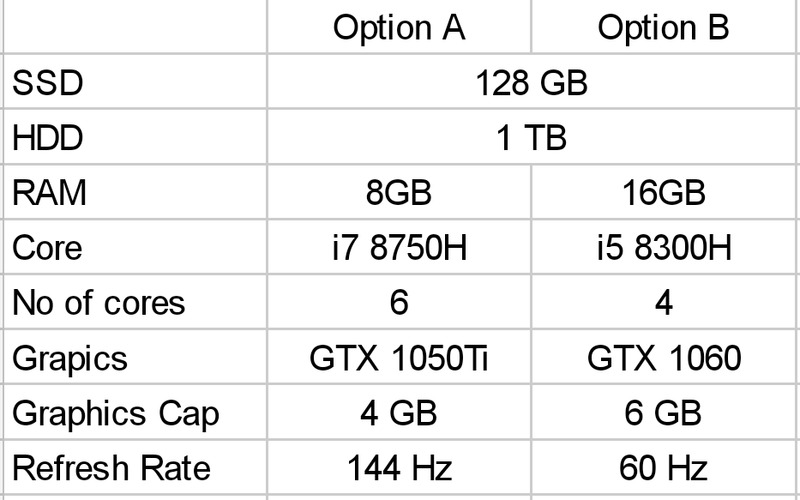 To say it plainly, just due to GPU alone Option B will be a considerably better gaming machine. I like the one you suggested. However, how is the cooling with asus? I saw the MSI one but it has the TN panel which I was trying to avoid. I'm more inclined towards option B. Don't listen to the person suggesting 1050 - it's crap, even if it's Ti. Get 1060 with an 8th gen i5 - it really is more than enough. On top of i7 overheating and throttling, resulting in less performance than i5, lol. MSI/Asus/etc. gaming laptop or a "selected components" laptop?